When McDonald's came out with their breakfast burritos years ago, I was a big fan of them. They're great to eat on the go and it still was pretty filling. 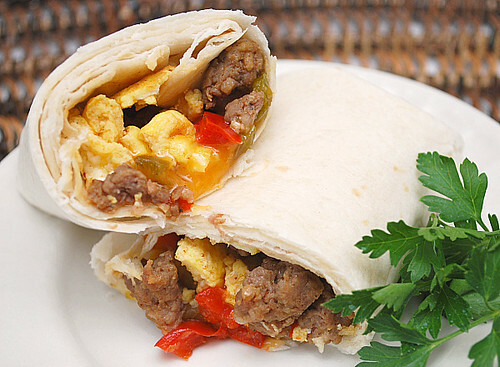 Since I had a stack of flour tortillas in my pantry, I decided to make these Southwestern Breakfast Burritos. What's great about this recipe is that they store well in the freezer and easily heat up either in the oven or microwave. 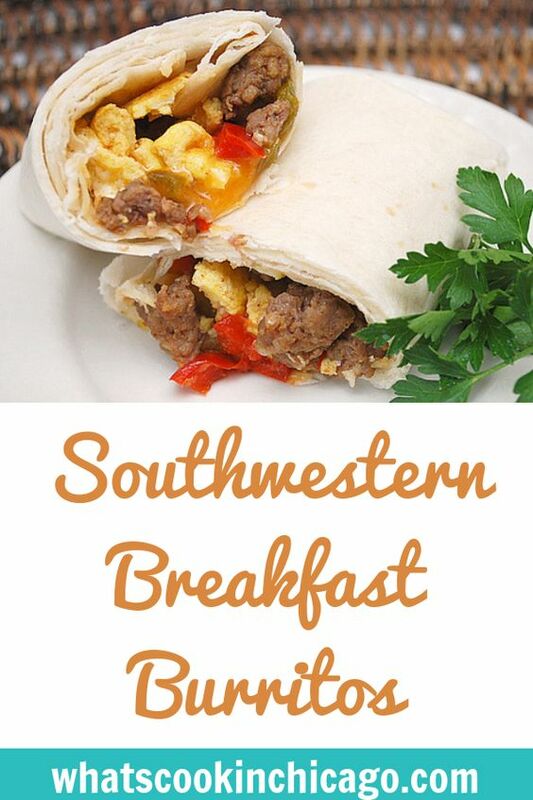 Just as one may assume, the filling is simply crumbled breakfast sausage seasoned with taco seasoning, diced onions and bell peppers, scrambled eggs, and shredded cheese. You can serve these up with your favorite salsa, sour cream and/or even guacamole if you'd like. These have been a favorite for breakfast lately so I may have to make more soon! In a medium skillet, crumble in sausage and cook until browned. Add onions and bell peppers; cook until softened. Remove from heat and allow to cool. In a medium sized bowl, whisk the eggs and season with salt and pepper as desired. Cook the eggs in a hot skillet and scramble. Add the eggs to the sausage and pepper mixture; toss to combine. Allow mixture to cool. Heat flour tortillas as directed on package to make them pliable. Place a desired amount of cheese on one side of a flour tortilla. Top with a couple spoonfuls of sausage & egg mixture. Carefully roll up the tortilla in a burrito fashion. 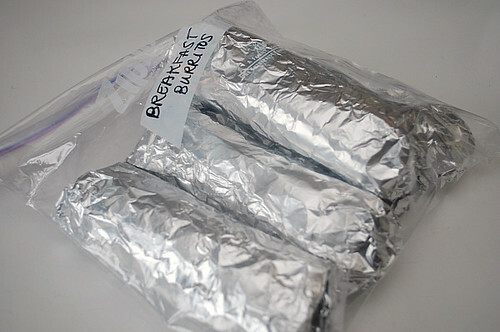 Wrap the burrito in foil and place in a gallon sized freezer bag; freeze. To serve, no need to defrost - just cook up from frozen. Heat up foil wrapped frozen burritos in a 350 degree oven for 30-35 minutes... or remove frozen burrito from foil, wrap in a damp paper towel and microwave for 2-3 minutes on high until warmed/hot. Joelen - have you ever made these or other breakfast products to freeze using an egg substitute like Egg Beaters? I can't eat eggs but can have Egg Beaters but haven't tried freezing them. @Ashley - I haven't used egg substitutes in awhile so I can't say if they would freeze well from personal experience. My guess is that they should be fine... considering there are quite a few products on the market that I've seen using egg subs and are frozen. Great post!! This would be so helpful during the school semesters! I'm still going to try out this recipe for the summer, though! Thanks for sharing! Thanks for posting this! I made these for my husband, and he brought two to work with him (one to give to a coworker). He said they were so good, he ended up eating both of them! Thanks for posting this easy recipe! dumb question - Are the heating direction for heating from freezer or after defrost? Thanks! I am just making this now and have a couple questions...no mention on when/where to add the taco seasoning, to the sausage? I had to drain the sausage, then added the seasoning (with a little water for lack of knowing what to do) then after I added the onions/peppers there was lots to drain again, and I lost some of the seasoning when doing that. I just made these yesterday, froze them, and we had them for breakfast this morning. They are very good. I did alter the recipe because we like less sausage with our eggs. I used 1 lb. sausage and 14 eggs. This made 11 burritos for me. Also, I had to bake these for quite a lot longer (20 min at 350 and 10 min at 400) to get them warm...and still ended up microwaving my husband's before he left for work. Me again...I heated from frozen today and also had to increase my time (20 min at 350 and still cold in the middle, when wrapped in foil, and they had sat out 1/2 hr from freezer). What I did was unwrap at 20 minutes, cut in half, sprinkle more cheese on and heat for 10 more minutes same heat, and all good. omg I just made these and they are delish... thank you everyone for the reheating tips but thank you Joelen for sharing this with us!!! I have been making these for years. The only problem I had with the is the eggs and susage would fall out while trying to eat them. So what I do is cook the susage, mix eggs and put all in a cake pan and bake. You can cut them into strips to fit in a tortilla. Mess free. Made these for the hubby for his morning commute! He loves them! Thank you!!! These sound delicious...can't wait to make! These are great! We made a few changes, and I'll publish my variation on my blog, but I still have a bunch of links over to you as the original creator of these yummy burritos! The whole family (even the somewhat picky kindergartner) loved them! Joelen- just found your blog and your recipes are ahhhhmazing. what size tortillas do you use for this recipe and where do you get them. im thinking 13" would be ideal but i dont know where to find them. help pls!! and thanks for sharing your recipes.. I just have a quick question... How long can i keep these in the freezer for before they go bad?